The holidays mean gift giving, and gift getting, but there's always the question of what to give. Brian has an easy time of it because I just put everything I want on my Amazon wish list and he knows to look there. 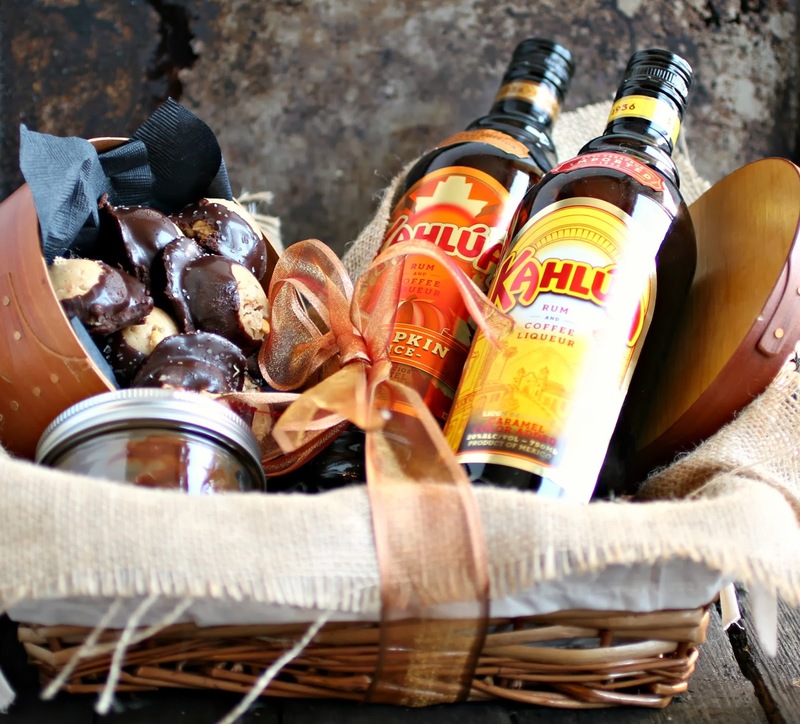 But when I'm invited to someone's home, I think an edible or drinkable gift is always happily received. Whether it's homemade or store bought depends on your level of comfort in making it but I like to do both. Lots of folks give wine but it can be so much fun to give an interesting liqueur, maybe with a drink recipe attached. This year we've made delicious cocktails with Kahlúa Pumpkin Spice and Kahlúa French Vanilla so both of those went into our gift baskets along with the recipes. And for something sweet, because I always think there should be something sweet, maybe a homemade cake, cookies or candy. This year I decided to try my hand at making some homemade candies and I chose one of my all-time favorite ingredients, peanut butter. I normally associate buckeye candy with children. 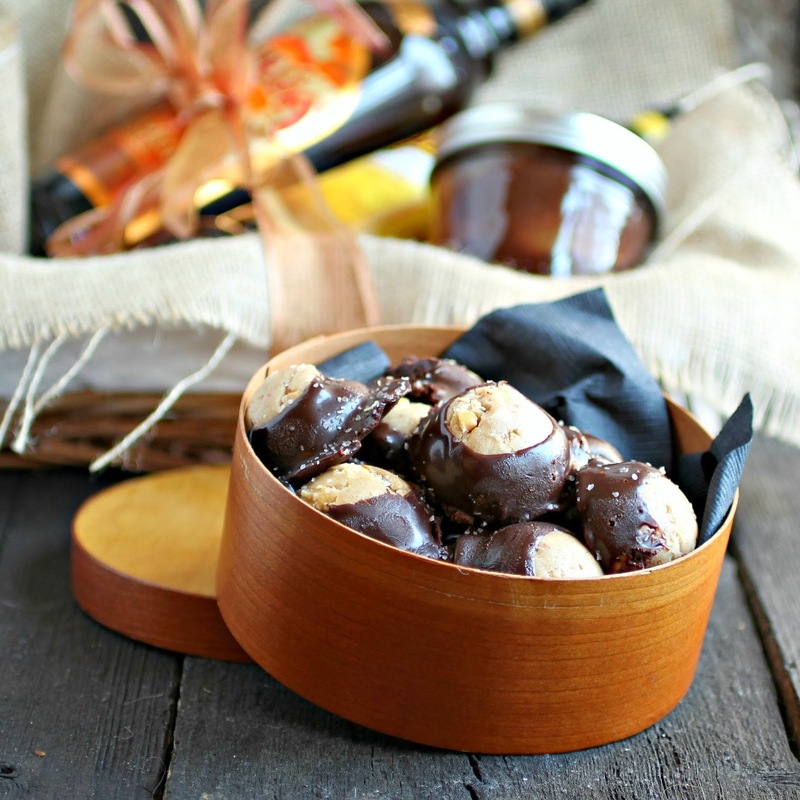 Smooth, sweetened peanut butter balls dipped in sweet milk chocolate. Yum! OK, I'm just a big kid because I love them. But around the holidays, Brian and I mostly entertain adults. We serve grown-up food and alcoholic beverages so I decided to bring a more adult spin to this delicious candy. 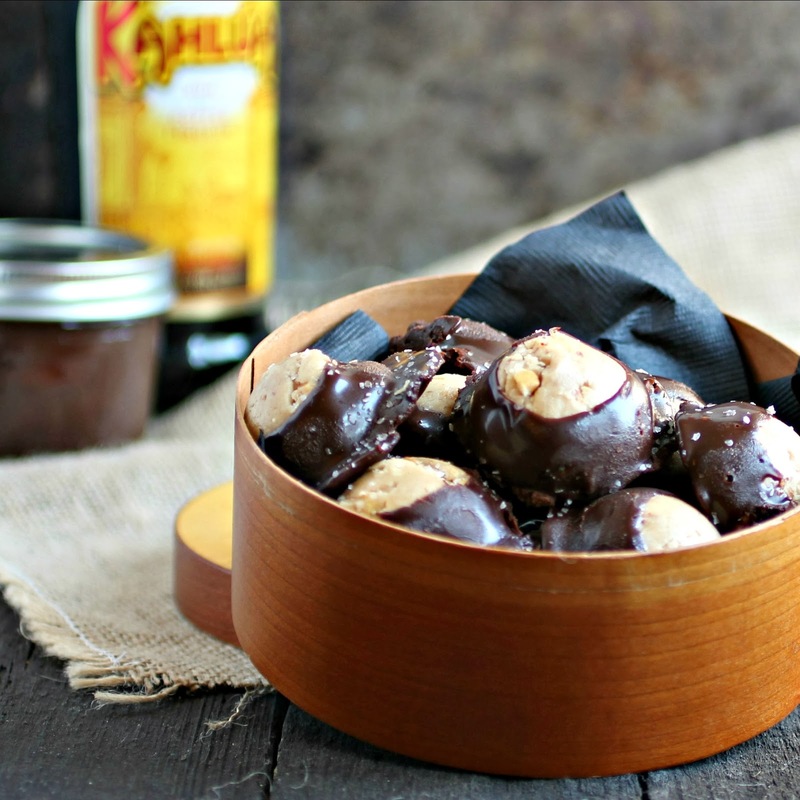 Since, when we serve after-dinner drinks, they frequently contain delicious coffee flavored Kahlúa liqueur, I incorporated that into the chocolate. A little bite from crunchy peanut butter and a sprinkling of sea salt to finish and I may have found my favorite new treat. And as for that after dinner drink, the classic Black Russian with equal parts Kahlúa and Absolut Vodka over ice (recipe from Kahlúa 's web site) is one of our long time favorites. Enjoy! Combine the peanut butter, butter, vanilla, confectioner's sugar and salt in a bowl and mix until thoroughly combined. Use a small scoop or your hands to form balls and place them on a dish lined with parchment paper. Insert a toothpick into each ball to make them easier to dip in the chocolate. Place the formed candies in the freezer to harden while you make the coating. Place the chocolate chips and butter in a bowl set over a pot of simmering water and stir occasionally until melted. Add the Kahlúa liqueur and stir. At this point, the chocolate may seize up a little. If so, add the tablespoon of milk and continue stirring until it's smoothed out again. Remove from the heat and allow to cool for about 10 minutes. Remove the peanut butter balls from the freezer and, gripping by the toothpick, dip each one about 3/4 into the chocolate. Place them back on the parchment paper, sprinkle on a bit of sea salt and refrigerate for about an hour for the chocolate to set up. Serve them with or without the toothpicks. I used a 1 oz. scoop and got about a dozen candies. These look marvelous! Being from Ohio, buckeyes have always been a favorite! Love the crunch! Oh my! What an upgrade to the plain Buckeye - which we love here. I'm going to try this next week when we have our Christmas baking marathon.